To fly is to be frustrated. If you’ve been traveling for long, you no doubt have your opinions about what airlines and airports are the biggest sources of suffering. Whether it is weather delays, getting stuck on the tarmac due to air traffic, maintenance problems, or missing a connection, it all feels outside of your control. But a little knowledge can help. The Bureau of Transportations has maintained a giant database of air traffic information for decades of flights -- point of origin, flight times, flight delays, type of delay, etc. It is 72 gigabytes of data...just the type of data that needs some visualization. JuiceKit™ to the rescue. 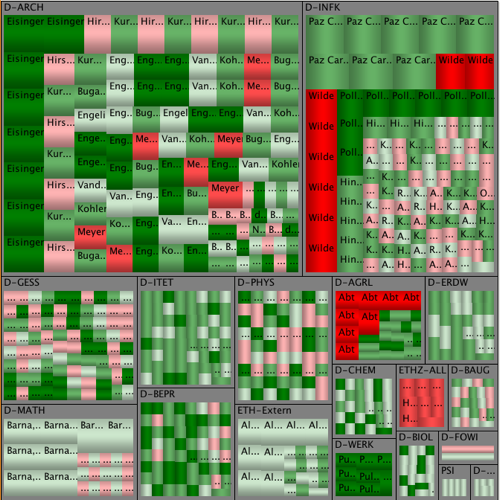 Treemap uses size to represent the number of flights by airline and by point of origin. 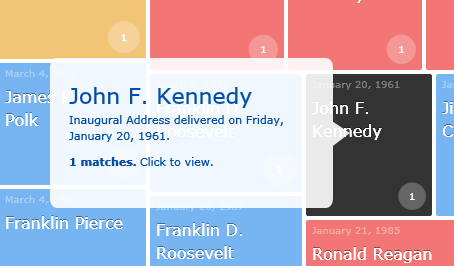 The color is used to show delay time -- we’ve got all sorts of delay metrics, each of which tells an interesting story. 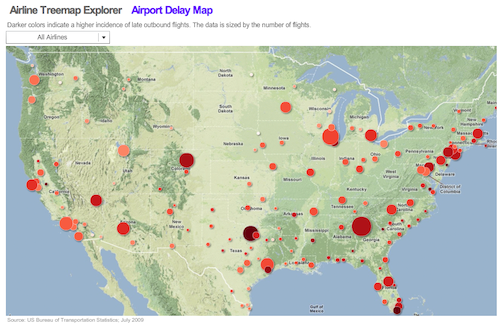 US map uses size to represent the number of flights and the color to display delay time. Filtering by airline yields additional details. There are some interesting insights that pop-out when you build a visualization this data. 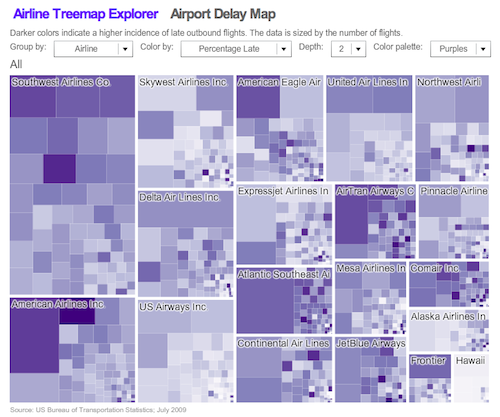 The different airline strategies are quickly apparent in the treemap. Hub-and-spoke airlines (Delta, Continental) have one or two dominant boxes (origin location), surrounded by lots of small locations. A point-to-point airline like Southwest looks entirely different with lots of similarly sized boxes. Flipping between delay types uncovers some unexpected results. For example, you might expect weather delays to be heavily correlated by airport. The data shows something a little different: Comair appears to be abnormally impacted by weather delays -- as if a dark cloud chases around their airplanes. While Comair might be overstating weather delay data to prevent paying for meal vouchers, a more reasonable Wikipedia investigation suggests that Comair flies smaller weather-susceptible Bombardier airplanes. For those of you following JuiceKit™ development, this is a demo of some of the newer features available in our open source Juicekit™ 1.2 distribution, and some of the features that will be coming to the 1.3 version. 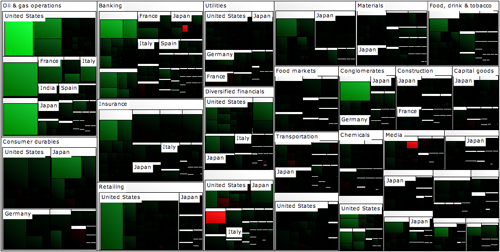 Treemap styling is now elegant, crisp, and allows for white borders, fixing a couple rendering bugs. 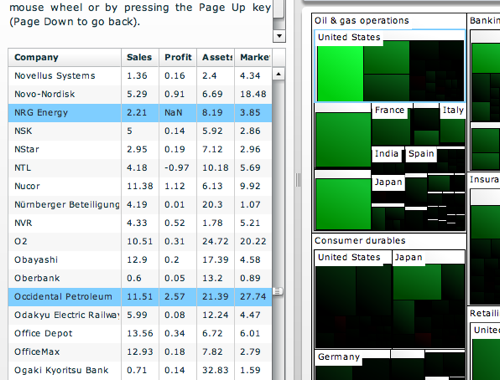 There is a new tree-level depth feature that can make it easier to navigate treemaps with lots of layers. The airports map demonstrates a geographic layout built using GeoLayout JuiceKit™ and Flare components. A major improvement demonstrated by the airline-selector dropdown is the ability to keep nodes consistent between data reloads. This allows us to animate the nodes even though they are generated by our new LiveQuery component. 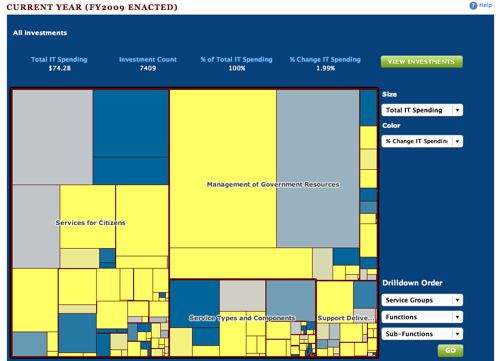 We were excited to see that Federal CIO Vivek Kundra and his team used our open-source JuiceKit™ treemap on the recently released Federal IT Spending Dashboard. 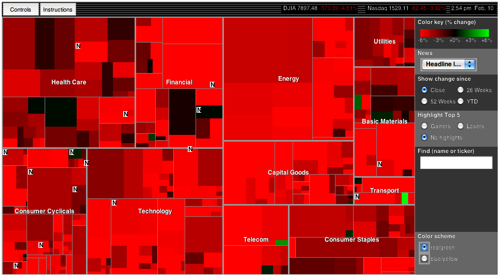 While Tim O’Reilly mistakenly gave credit for all the visualizations to Fusion Charts, we know better. A mother always recognizes her baby. I bet Google also recognized their Motion Chart. 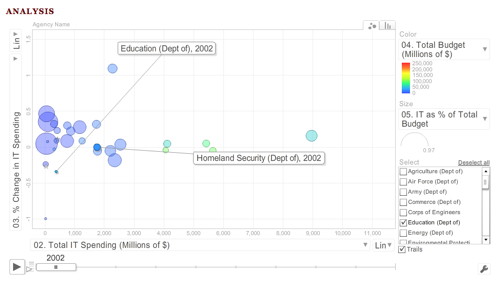 We thought it would be a nice demonstration to use data from the 1997 and 2002 US Economic Census (unfortunately 2007 isn’t out yet) to see what kind of stories bubble forth. The demonstration was built using a component from JuiceKit™, our recently open sourced Software Development Kit (SDK) for building Information Experience™ applications. The SDK can be used by web designers and developers to build graphically rich and interactive information displays. JuiceKit™ currently integrates with Adobe Flex to create components that are easy to implement and aesthetically pleasing. 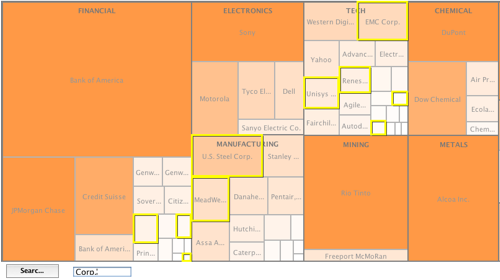 Check out the treemap here. The rise of CostCo, Amazon, and Home Depot: This time period saw strong growth in warehouse clubs and superstores, online retailers (“electronic shopping”), and home centers. From manufacturing to services economy: Most of the growth was in service sectors (financial services, healthcare, professional services) while manufacturing was shrinking. 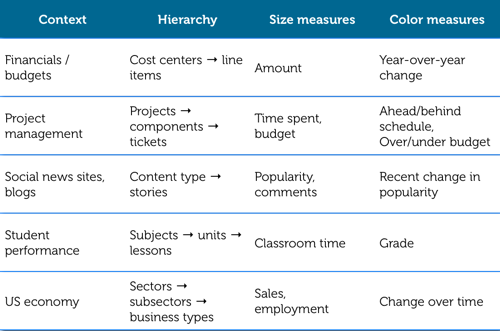 Productivity gains, even in adversity: For struggling sectors, the employee declines almost always outpaced the sales declines — squeezing more sales per employee. No wonder hospital TV shows are so popular: Hospitals are the largest single employer as a business-type. Starbucks and Krispy Kreme steal the unhealthy food dollar: Cookies and frozen yogurt retail saw a rapid decline while coffee and donut shops flourished. Goodbye stand-alone pump: Gas stations with convenience stores overtook the just-plain gas station. It can’t last, can it? : Mortgage broker payroll up 177%. Update: Thanks for checking this out! However, we have taken this visualization down. For more recent examples, please check out our gallery page. We’ve seen a lot of anxiety about the huge price tag of the stimulus bill winding its way through Congress. Some of the complaining is about the difficulty in understanding the contents of this complex legislation. Certainly the stimulus bill looks impenetrable if you try to sift through 700 pages of details or even a 25-page summary. In response many people evaluate it based on their gut feel. 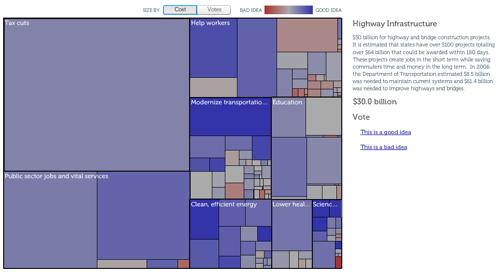 To help out, we’ve created the Juice Stimulus Bill Explorer - a treemap visualization that summarizes the House version of the stimulus bill and let’s you vote on its pieces. 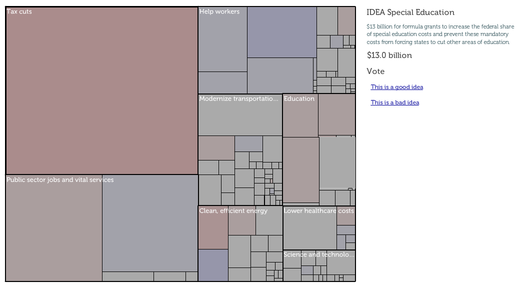 The data in this treemap comes from the 1/15/09 summary (pdf) of the House of Representatives version of the American Recovery and Reinvestment Act. Selecting any box will show a description of the individual program, the price tag, and an opportunity to express whether you like or dislike the idea. 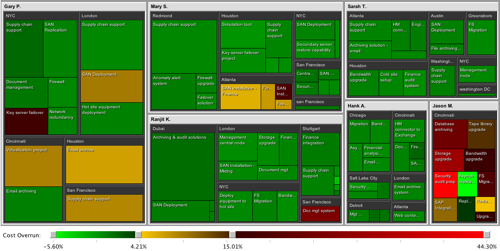 The treemap boxes are sized by the proposed cost of each program. The color is based on the average level of support for the program from user votes. Thanks to Scott Love for encouraging us to put this together.